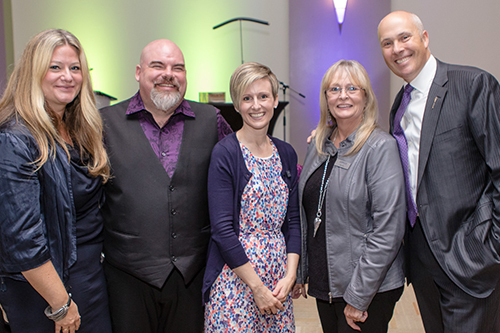 From left to right: Catherine Bell, Presenting Sponsor of our Speaker, Big Daddy Tazz, Jerilyn Dressler, Director of Operations at DC, Joan Roy, Executive Director at DC, and Greg Clark, Leader of the Alberta Party at our Lend An Ear Breakfast in September. 2016 was another difficult year for Calgarians. As the recession stretched into year two, thousands of people faced layoffs, and long periods of unemployment causing increased stress and anxiety. For many, the personal struggles will continue as our city and province heads into another tough year. We are living through the the effects of a prolonged recession and we saw the impact on our crisis lines and in our counselling sessions. In 2016 we experienced an 11% YTD increase in crisis contact volume compared to 2015. Calls to 211 increased by 7.7% compared to 2015 and our counselling intakes increased by 16.4%. Thanks to the incredible support we received this year – from our volunteers, staff, sponsors, donors, partners and members of the media – we were able to meet the increased demand and continue to provide an excellent level of crisis support to tens of thousands of Calgarians in distress. “In a challenging year that Alberta, and particularly Calgary, has faced we are thankful for the support of our funders and donors, the hard work and commitment that our volunteers show our callers, the dedication of our staff and our Board, and the community,” said Joan Roy, Executive Director. Our 230 crisis line volunteers provide compassion, support, crisis intervention, information and referrals to those who call or chat online with us. They are there 24/7/365, giving up their weekends and holidays to ensure that everyone is heard. Another team of volunteers also support Distress Centre by attending and supporting various fundraising events throughout the year, and volunteering at community events to help us increase the awareness for our services. Our ConnecTeen volunteers (15 to 20 years of age) provide daily peer support to youth in Calgary. They juggle their volunteer commitment with school, extra-curricular activities, jobs and more to give back to the community. Our volunteer Board of Directors are leaders within the Calgary business community and they provide governance, strategy and policy guidance to our Leadership Team. Distress Centre has very dedicated professional staff. Our counselling team, Contact Centre and 211 staff, and support staff in the areas of finance, fundraising, communications and administration are committed to providing the best level of service and support to Calgary’s most vulnerable. 2016 was a difficult fundraising year for charities in Calgary. Therefore, we feel very grateful for the financial support and sponsorship we received in 2016 from our donors (individuals, companies, and Foundations). Their continued support allowed us to meet the increased demand and continue to provide an excellent level of 24/7 crisis support to the community. It was announced that Canada is getting a national suicide prevention line in 2017. The service, which will use text, chat and phone technology, will integrate and link existing regional distress and crisis line services (including ours!) across Canada. Our Executive Director, Joan Roy, has spent 11 years making this a reality. We lost fellow colleague, Michelle Wickerson, a beloved mother, wife, daughter, sister and friend. Michelle spent 11 years at Distress Centre and in November, we were able to honour her memory and her legacy by introducing the Michelle Wickerson Memorial Award in Social Work. Leslie Weekes became our Board Chair and we welcomed three new Directors to the Board: Barbara H. Revay, Ian Minnifee and Janet Segato. Distress Centre was selected as the 2016 recipient of the Willow Park Charity Golf Classic. The tournament took place in July and raised $407,350! Comedian Big Daddy Tazz headlined our Lend An Ear Breakfast on September 22nd and had guests laughing so hard they had tears in their eyes. The uplifting event raised $30,000 for our crisis services. Our Volunteer Appreciation Event took place on April 28th at Fort Calgary. We treasure this opportunity to show our gratitude to our amazing volunteers. 211 responded to increased calls after the devastating fires in the Fort McMurray/Wood Buffalo region brought thousands of evacuees to Calgary. From May 4th to May 11th, 34.6% of calls to 211 were related to the fires. The 8th annual Calgary Hitmen game in support of ConnecTeen took place on March 20th and brought increased awareness to our youth program. We received amazing support from a variety of Community Events, including Outrun the Stigma, Listen Up! Calgary, Darkness Into Light Calgary and Music 4 Life. ConnecTeen volunteer, Ryan Costello, won the Youth Central Youth of Distinction Award in the category of Peer Support. Distress Centre partnered with the University of Calgary’s SU Wellness Centre to provide after-hours support to students. Distress Centre is here for everyone. We do not define crisis. So for those of you who made the call – thank you. For those who had the courage to write that email, or initiate a text, thank you. Distress Centre volunteers and staff are looking forward to 2017 and with your continued support we will continue to provide, improve and expand 24/7 crisis services to ensure that everyone is heard.